Bishop Len Brennan arrives unexpectedly at the parochial house. His reason for arriving at the Godforsaken place is because the Pope is concerned about the blasphemous film The Passion of St Tibulus being shown on Craggy Island. Banned everywhere else, it is being shown on Craggy Island because of some strange loophole. Bishop Brennan wants Ted to organise a protest immediately. They go to the cinema to protest but instead end up watching the sexually explicit film. 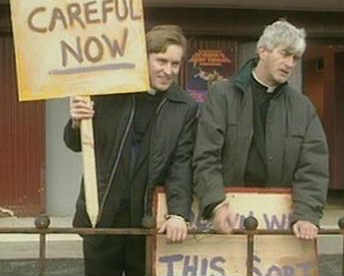 The next morning, Bishop Brennan turns up and orders Ted and Dougal to take their protest outside the cinema even though there are seven hours until it even opens. They stand outside the cinema with placards reading Down with this sort of thing and Careful now. Dougal buys some handcuffs to fasten themselves to the railings to gain more attention. Their actions have the opposite effect and attracts people to see the film. Fed up, Ted and Dougal decide to go home, but unfortunately Dougal has lost the key to the handcuffs. Back at the parochial house and still chained to the railings, Bishop Brennan lays into the priests and tells them that they are going to be sent away to parishes at even worse locations than Craggy Island. Jack punches him in the face and Bishop Brennan leaves. Then Jack plays a video that he found inside Bishop Brennan's bag. It is labelled "Holiday '95" and shows Bishop Brennan cavorting on a beach with his mistress and son. 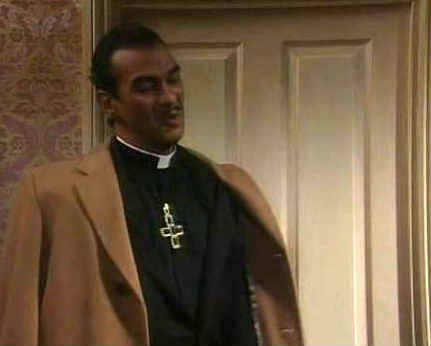 Ted realises that they can use the video to blackmail Bishop Brennan into letting them stay at Craggy Island. Father Ted: [About Reverend Green from Cluedo] Those Protestants, up to no good as usual. Bishop Brennan: The amount of peoples' lives irreparably damaged! Father Dougal: They were only nuns. Bishop Brennan: Nuns are people too! First appearance of Bishop Brennan. Third appearance of Mary and John. Dougal buys some handcuffs from their shop. The west side of Craggy island broke off in a storm. They make candles out of Father Jack's ear wax. Father Jack likes Sharon Stone films. The cinema used in the episode was in Greystones, Co.Wicklow. It is now closed after commercial difficulties. One of the writers said that the episode was partially inspired by Derek Jarman's 1976 film, Sebastiane. The VCR Father Hernandez gives Dougal was already on the top of the television in the previous episode. Jim Norton, who plays Bishop Brennan, is credited as a "Special Guest" in the opening titles.